White, typical of the region, Bianchetto and Black, in summer and winter varieties, growing, hidden on our land, sheltered from the light of the sun in symbiosis with the roots of other plants that nourish them. 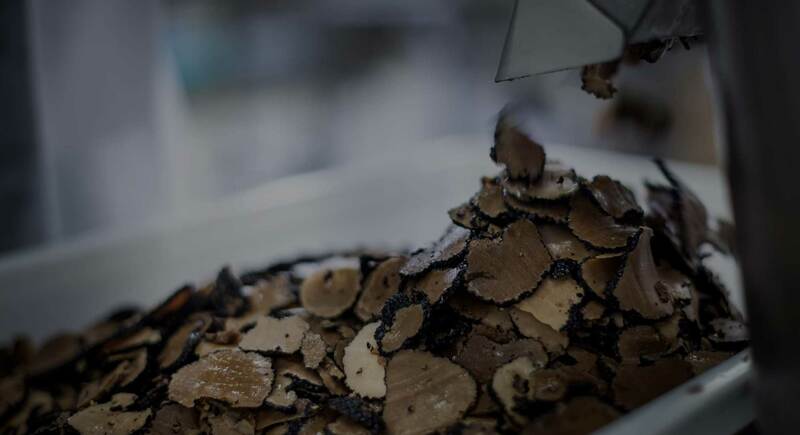 Esteemed Tubers with unmistakable natural characteristics and taste enhanced with the utmost attention during their journey, from the collection of them, to the washing and drying and packing in special designated containers up to their distribution: only these become Sacchi Tartufi Truffles. Every one of our products expresses history, culture and the passion for the land from which these fruits are borne. A unique range of products that has been enriched over the years and is in continuous evolution: from fresh truffles to creams, from condiments to pasta, from flour to honey, from cheeses to cured meats and even liqueurs. All united with the principal ingredient, the truffle; scented, flavorful, different consistencies satisfying the palates of all lovers of these jewels from a long gastronomical tradition. We want to give you a small moment of happiness with every taste.